The funeral of the boy king Tutankhamun would have been filled with various death rituals and ceremonies. We know a great deal about his burial as details of it are painted on the wall of his burial chamber. The death of the young King Tut was untimely and unexpected. His tomb had to be prepared hastily. King Tut died in 1325BC and his funeral would have occurred about 70 days later after the embalming and mummification process and death rituals had been completed. The death rituals and ceremonies preceding the burial of the Pharaoh Tutankhamun were dictated by the Ancient Egyptian belief that every person was thought to have three souls called the Ka, the Ba and the Akh. These 3 elements of the soul, were believed to be perishable and therefore at great risk. The process of embalming, mummification, death rituals, funerary text, magic spells and even the tomb itself used for the burial of Tutankhamun would ensure the preservation of his Ka, Ba and Ahk. The death rituals kept the soul alive and ensured the Pharaoh Tutankhamun a clear path to the Afterlife. The purpose of preserving and embalming the dead body of King Tut was the belief that the body would be necessary in the afterlife. The Ancient Egyptians used a special and ritualised process to remove all moisture from the body leaving a dried form that would not easily decay. The brains and the brain fluid were drained out of the corpse of Tutankhamun and his stomach, liver, lungs and intestines were removed and stored in special alabaster containers called canopic jars. The heart of Tutankhamun was left in the body as the Ancient Egyptians believed the heart would be needed on the Day of Judgement in the Underworld. The body cavity was then sewn together and covered with layers with linen shrouds and bandages. Between the layers gold amulets and jewelry were added - no less than 143 separate items were wrapped with the mummy of King Tut. 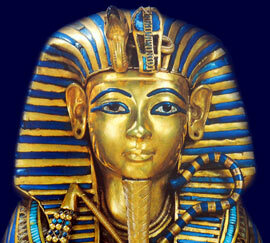 The embalming and mummification process preceding the Funeral of Tutankhamun would have taken 70 days. The embalmed mummy of King Tut was then sealed in his man-shaped (anthropoid) coffin. In fact there were three coffins which were all painted with the likeness of Tutankhamun, the two outer coffins were made of gilded wood but the final coffin was made of solid gold. These likeness paintings were extremely important as they provided the dead with a face in the afterlife. The solid gold coffin housed the mummy of King Tut and his fabulous golden death mask was placed directly over the mummified head of Tutankhamun. After 70 days following his death an elaborate funeral procession, fit for the Pharaoh, headed towards the designated tomb of the deceased. The location of the tomb was a closely kept secret. The mummy, lying in the nested coffins, was placed on a bier protected by effigies of gods. Oxen would have pulled the sledge through the desert heading towards the Valley of the Kings. The members of the funeral procession consisted of the new Pharaoh Ay, members of the royal family, the vizier, the generals and court dignitaries. These people would have followed the musicians who headed the procession. Behind the chief funeral procession wailing mourners followed accompanied by priests, some wearing animal masks including the jackal masked impersonator of the god Anubis. Servants or slaves followed carrying the items that would be buried with the mummy in the tomb. The funeral guests wore white sandals and white headbands which were worn at holy or sacred ceremonies. The funeral procession ended when the location of the tomb was reached and the 'Opening of the Mouth' death rituals commenced. The funeral of Tutankhamun and the Ancient Egyptian Death rituals would have ended with a feast and a celebration as the boy King Tut had started his journey into the glorious afterlife. Each section of this Funeral of Tutankhamun website addresses all topics and provides interesting facts and information about the Golden Age of Pharaohs and of Egypt. The Sitemap provides full details of all of the information and facts provided about the fascinating subject of the Pharaoh Funeral of Tutankhamun - Tutankhamun!